There’s an intriguing tradition of fruit-based soups in Ashkenazi cooking, much as there is in Scandinavian cuisine. 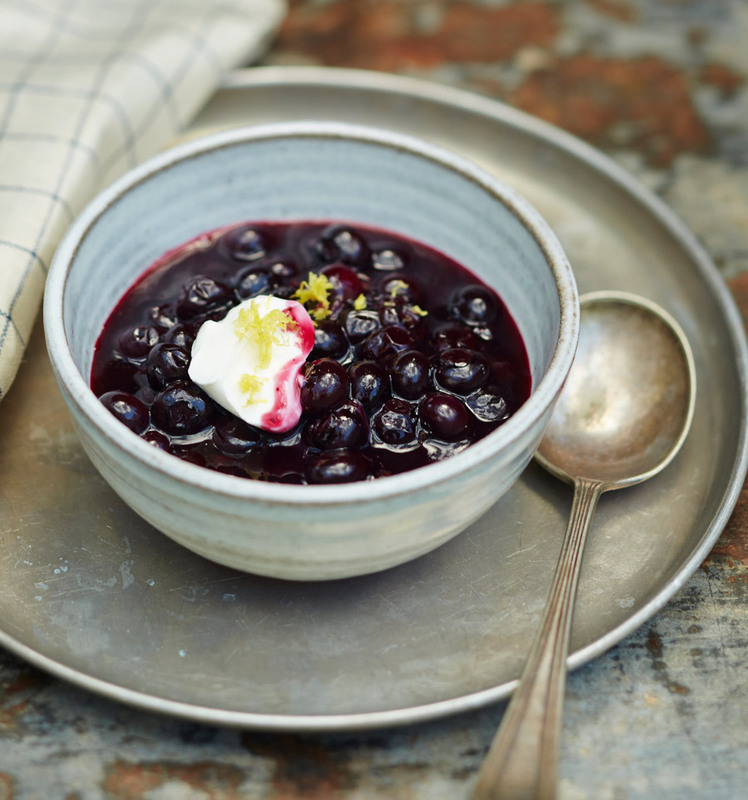 Growing up, I was familiar with sour cherry soup, but I hadn’t heard of blueberry soup until I began reviewing old Jewish cookbooks. I’m glad I found it. Tie the cinnamon sticks, cloves, coriander seeds, and peppercorns in a square of cheesecloth for easy removal later. In a medium saucepan, combine the blueberries, honey, lemon juice, spice bundle, and cold water. Bring to a boil over medium-high heat, then reduce the heat to maintain a simmer and cook for about 8 minutes. The berries will break down quite quickly and release a good deal of liquid. Remove the pot from the heat. Very slowly spoon 3 tablespoons of the hot blueberry liquid into the egg yolks (1 tablespoon at a time to avoid curdling the egg yolks). Whisk with a fork until thick, 1 to 2 minutes, then return the blueberry-egg mixture to the pot and return the soup just to a boil. Immediately reduce the heat to maintain a simmer and cook for 3 minutes more, until the soup has thickened. Remove from the heat, and immediately mix in the 2 teaspoons of lemon zest. Remove the spice bundle before serving hot, cold, or at room temperature, garnished with sour cream and remaining lemon zest. Liz Alpern is the cofounder, with Jeffrey Yoskowitz, of The Gefilteria, a New York–based dining event project that showcases and celebrates Jewish foods from the Ashkenazi culinary tradition, as well as coauthor of The Gefilte Manifesto. She's also the founder of Queer Soup Night, which we featured in "Queer Supper Clubs Save the Day" in Issue 5.She was featured in Forbes’ 30 Under 30 list for food and wine and was named one of the Forward 50 for 2016. Excerpted from The Gefilte Manifesto by Liz Alpern and Jeffrey Yoskowitz, (Flatiron Books). Copyright © 2016 by The Gefilte Manifesto, LLC. Hanukkah is the time of year I feel the most Jewish. While the rest of New York is feverishly buying gifts and planning big family meals, I’m quietly grating potatoes by the light of the menorah. In contrast to so many other Jewish holidays, Hanukkah celebrations are relaxed and loose. It feels like all I need to do is fry up some latkes, and I’m in the perfect holiday spirit. Shred the potatoes, parsnip, turnip, and onion on the large holes of a box grater or in a food processor using the shredder plate. Place the grated vegetables in a large bowl and add cold water to cover. Let sit for about 5 minutes. Drain the vegetables in a colander and squeeze out as much liquid as possible from the shreds into a bowl. It’s helpful to take cheesecloth or a clean thin kitchen towel, drape in an empty bowl, then pour in the shredded vegetables. Wrap the cheesecloth or towel around the vegetables and squeeze tightly in the bowl. Repeat until as much liquid as possible has been removed. White potato starch will collect at the bottom of the bowl. Carefully drain off the water, leaving the potato starch. Set aside. Place the drained vegetable shreds in a large bowl. Add the scallions, eggs, salt, pepper, flour, bread crumbs, and the reserved potato starch. Mix well, preferably using your hands. In a 9-inch nonstick or cast-iron skillet, heat a layer of schmaltz or oil, about 1/8-inch deep, over medium heat. Form the latke batter into thin patties, using about 2 tablespoons for each. As you form the patties, squeeze out and discard any excess liquid. Carefully slip the patties, about 4 at a time, into the pan and fry for 2 to 3 minutes on each side, or until golden brown and crisp. Take care to flip them only once to avoid excess oil absorption. If the pan begins to smoke at all, add more schmaltz or oil and let it heat up again before frying another batch of latkes. Remove the latkes from the pan and place on a baking sheet lined with paper towels to drain the excess fat. 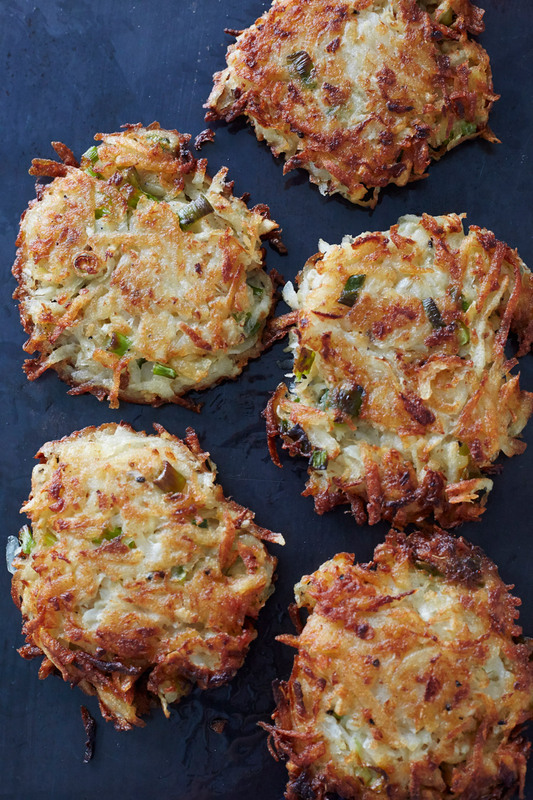 Latkes are best and crispiest when served right away. If serving later, transfer to a separate casserole dish or baking sheet and place in the oven at 200ºF to keep warm until serving. Serve hot, topped with applesauce and/or sour cream. Liz Alpern is the cofounder, with Jeffrey Yoskowitz, of The Gefilteria, a New York–based dining event project that showcases and celebrates Jewish foods from the Ashkenazi culinary tradition, as well as coauthor of The Gefilte Manifesto. She's also the founder of Queer Soup Night, which we featured in "Queer Supper Clubs Save the Day" in Issue 5. She was featured in Forbes’ 30 Under 30 list for food and wine and was named one of the Forward 50 for 2016. Recipe excerpted from The Gefilte Manifesto by Liz Alpern and Jeffrey Yoskowitz, (Flatiron Books). Copyright © 2016 by The Gefilte Manifesto, LLC. Join us and Queer Soup Night this Sunday, November 12th! On Sunday, November 12, 2017, Jarry will partner with Queer Soup Night for the next installment of their supper club, benefitting the New Sanctuary Coalition of NY—head to our events page for more information and to RSVP! In anticipation of Sunday, we're sharing an excerpt from our Issue 5 story "Queer Supper Clubs Save the Day," a survey of a few notable LGBTQ supper clubs across the United States, where we talk with Liz Alpern about why Queer Soup Night came into existence, and what to expect if you attend one. When and where is it? Always on Sunday nights, roughly once every month or two, at varying locations in Brooklyn, NY. What’s on the menu? Soup! Three, sometimes four, soups are offered, and notable queer chefs and cooks are invited to make them. There are always vegan and vegetarian options, as well as accompaniments like locally-made bread and biscuits. Alcohol is for sale, but isn’t the focus. “I feel strongly that we need to connect in spaces that are not alcohol-centric,” Liz says. How much? Suggested donation is $10. Each soup night supports a different charity, one that’s both relevant to the queer community and based locally, and also one where the amount of money raised (anywhere from $500 to $2000) will have a meaningful impact. “One of the things I felt was important was for people who don’t have a lot of money to spend, to feel like they can give and they can donate, and that their donations are really valued,” Liz said. For more information: Details about forthcoming Queer Soup Nights are announced on Instagram and Facebook.